What inspires me to cook most of the time are people whom I love. My mum's off day is on Mondays, so as much as I could, I would want to spend Mondays cooking & eating at home with my family; home-cooked meals are the best after all! We had quite a feast last night since I did some 'supermarket-sweep' last week. Chicken wasn't too expensive & so were the mangoes! It was totally random as I've never really bought mangoes for cooking, but I just thought of cooking mango chicken for the 1st time in my life from scratch! I had NO clue how to cook mango chicken. Most of the time, the mango chicken that I had at restaurants were either deep-fried & have some gravy topped with fresh mangoes or those Thai-style green mangoes kerabu with chicken. I wanted a not too Chinese yet not too Western chicken dish, fragrant, rich, & yet without frying as the cooking method cos the entire apartment would be oily. My best friend in the kitchen is the oven, but because I was back at my parents' house, all we had was the oven toaster! It had to cook up a miracle somehow! 1. Preheat oven at around 200°C for 10 minutes. 2. Place all the ingredients of the marinade into the blender & blend 'til it becomes a thick sauce. You may adjust the taste of your sauce accordingly. 5. Wrap the chicken with the foil. Bake the chicken at 200°C for 20 minutes/until it is cooked. 6. Unwrap the chicken & pour out the gravy from the foil wrap into a bowl. Set the gravy aside. 7. Place the chicken with the foil now unwrapped (leaving the chicken 'exposed') back into the hot oven. 8. Bake 'til the chicken skin turns golden brown & if possible, crispy! It should take another 5-8 minutes for the magic to take place. 9. 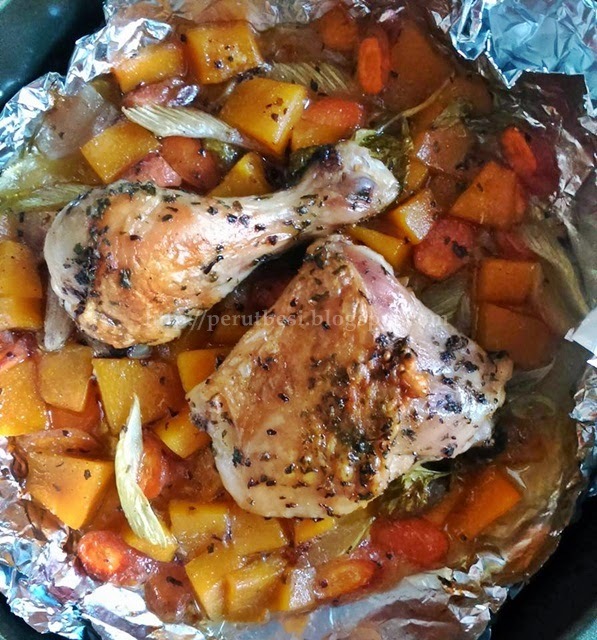 Remove the baked chicken from the foil & place it on a plate. 10. Place the mangoes on top of the chicken & drizzle the gravy over the mangoes & chicken pieces. The chicken dish is finally ready to be served & enjoyed! I found the chicken very fragrant! The gravy was luscious, smooth & well-balanced in sweetness, savory & a slight tangy taste from the cider. When eaten together with the freshly cut mangoes, ah, it was just music in my mouth! My recipe may not be 100% accurate as I go by "feel" most of the time. If you try it, I hope it'll turn out great as well! Enjoy! Note: I'm looking forward to participate in my 1st cooking competition this weekend i.e. Philips Cooking Challenge @ Empire Shopping Gallery! I wonder who my partner will be & what we'll be cooking since it's all by drawing lots...*nervous yet excited* Keep me in prayer for an enjoyable time & favor for success! 1. Wash the chicken pieces under running tap water. 2. Drain the chicken pieces & place it in a bowl/chopping board. 4. Sprinkle a pinch of salt & some pepper on the pieces of chicken. 5. With your hands, rub the salt & pepper onto the pieces of chicken. 6. Sprinkle ½ tsp of basil, ½ tsp of parsley onto the pieces of chicken. 7. With your hands, gently dab the herbs onto the pieces of chicken. 8. Allow the chicken pieces to “rest” & be marinated for at least 10-15 minutes. 2. Place all the vegetables onto the pan; random is good! 3. Drizzle cooking/olive oil onto the vegetables. 4. Sprinkle a pinch of salt & some pepper onto the vegetables. 5. Sprinkle 1 tsp of basil, 1 tsp of parsley onto the vegetables. 7. Pour the 3 tbsp of water onto the vegetable mix. 1. Cover the baking pan with an aluminum foil. 3. Remove the pan from the oven & remove the aluminum foil. 4. Place the pieces of chicken on top of the vegetables. 5. Cover the baking pan with the aluminum foil again. 7. Once the chicken pieces are cooked, remove the aluminum foil cover. 8. Brush each piece of chicken with some butter. 9. Bake just the top of the chicken for another 10 minutes, turning the pan to ensure the chicken skin is evenly roasted ‘til golden brown & crispy. Optional: Add more water (1 tbsp at a time) onto the vegetables in case it burns or becomes too dry for your liking. 10. Remove the pan from the oven & serve hot with a side of rice or pasta!